The shutdown of several government agencies spawned a lot of "takes-two-to-tango" talk. The "two" in the "tango" refers, of course, to the big rift between President Donald Trump and the Democratic-run House of Representatives over a border wall, and their need to reach a deal for day-to-day operations to resume. But there's more to this smackdown than Trump's "me-against-them" exhibition. Namely, there's Senate Majority Leader Mitch McConnell. GOP members led by McConnell (R-Ky.) last month took action on the issue that Democrats supported. They voted to fund the affected federal agencies into February, which would have left immigration and security still to be negotiated. The Congress had never treated Trump's wall as an emergency. Many wonder if even White House staffers did. Suddenly last month, Trump sandbagged McConnell, saying he wouldn't sign off on budget measures without the demanded $5.6 billion in wall money. 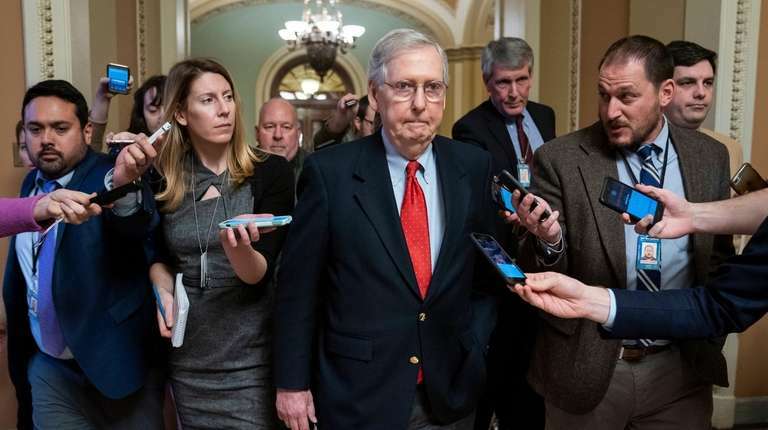 Like many elected Republicans, McConnell neither sang too loudly in the "build-that-wall" chorus nor openly resisted. He cannot like the position Trump put him in. He prefers keeping things flexible and controlling bills that Trump signs. So McConnell has tried to keep his head low as a Trump-vexed House and a dug-in chief executive occupy the spotlight. House Democrats voted upon their takeover to reopen agencies. McConnell declined to follow up. He called the House bills mere "political stunts" given that Trump won't sign them. But while Trump unveiled a proposal Saturday that House Speaker Nancy Pelosi (D-Calif.) instantly rejected, McConnell said he will introduce it on the Senate floor. He denies this would be a "show vote," but that's what it looks like. Trump also performed a zero-sum stunt last Thursday. He told Pelosi he's canceling the official government jet for an official overseas trip. This answered her own stunt suggesting that he put off his State of the Union speech. Can McConnell negotiate for Trump? Maybe not. Trump shot down Vice President Mike Pence earlier this month, who had suggested splitting the difference and agreeing to $2.5 billion, which the Democrats didn't accept. "No, not $2.5 billion, no — we’re asking for $5.6 [billion]" Trump said at a Cabinet meeting Jan. 2. There are still various ways the shutdown could end. McConnell's crew could tell the president they've held out long enough and send him a wall-free bill, forcing him to either approve or veto it. Trump could sign it and blame Pelosi and McConnell for blocking the wall. But this scenario sounds unlikely. The two houses could conventionally agree to big or small concessions, allowing Trump to save face. The shutdown can end any time the president feels like it. He'd really feel like it if he can tell his fans he won something. For now McConnell remains in the middle, pubilicly tethered to Trump.